“We do the best that we can with what we have, in the time we have, in the place we are.” This modest aphorism offered by Terry Button of Ramona Farms captures the spirit of service that was evident throughout the WRRC’s annual conference, “Irrigated Agriculture in Arizona: A Fresh Perspective.” Farmers and the people who work with them presented their perspectives, sharing their knowledge and experience with the 325 people gathered to learn about water issues faced by Arizona’s agricultural industry. Ramona Farms specializes in traditional foods that are nutritious and renew links with cultural and family roots. Inspired by the example and wisdom of Ramona’s father, who foresaw her future in farming on Gila River lands, the Buttons went through tough times and brought themselves from “horse and buggy” farming to a modern operation with the help of university-based knowledge. 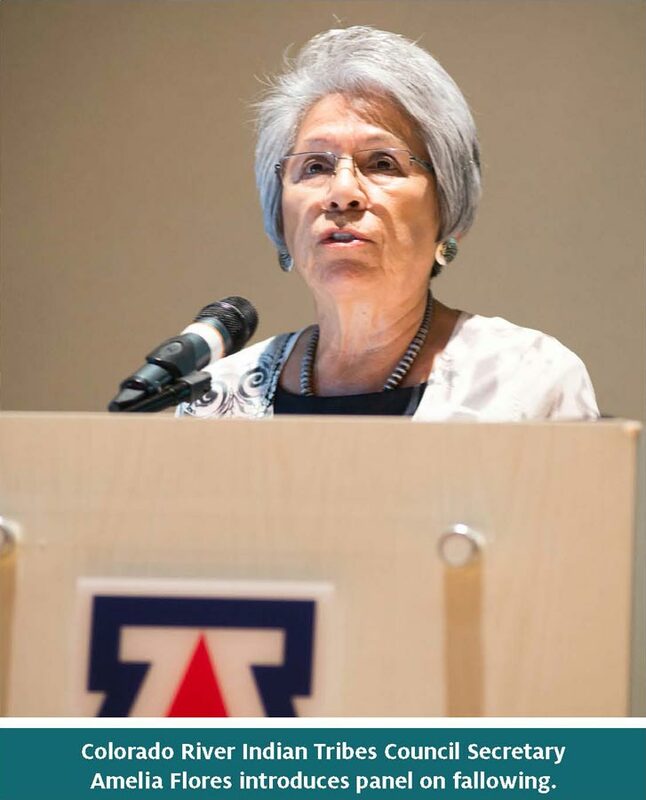 Extension, both pointed out that the University of Arizona is well-placed to study problems of arid regions. Burgess further emphasized the value of water management in deserts and the water efficiency of Arizona’s agriculture. “Water is a practical problem we work with people to solve,” said Silvertooth. The agriculture sector, which accounts for approximately 70 percent of the water used in Arizona, is feeling the pressure of impending shortages and growing demands by other water-using sectors. More than one speaker refuted the idea that agricultural water represents a reservoir that can be drawn on as the solution to shortages in other sectors. Killian emphasized the high quality of Arizona’s crops and called it our moral imperative to feed the world. The requirements for productive agriculture are land with good soils, sunlight, and water. Arizona is rich in two of these. Following up on Burgess’s opening observation that water turns sunlight into life, he noted that the judicious use of water has given Arizona some of the most productive agriculture in the country. 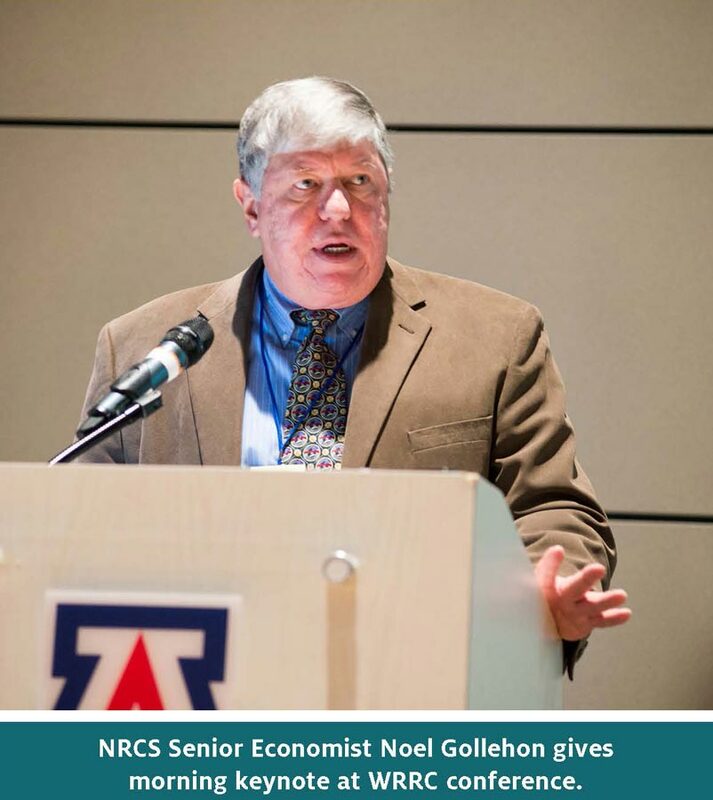 According to Noel Gollehon, a senior economist at the USDA Natural Resources Conservation Service, Arizona “punches above its weight” in land efficiency with a rank of 17th among states in cultivated acres and a rank of 10th in agricultural sales. Kevin Rogers, farmer and President of the Arizona Farm Bureau, pointed out, “The public is going to have something to say about what we do about water.” He called for agriculture to advocate with the public about what it does. “They seem to be troubled that we’re shipping our water in products and don’t understand that’s what the country does.” In Arizona, agriculture is a $17 billion industry with national and global impacts. With world population projected to grow to 9.1 billion people by 2050, overall food production would have to increase by about 70 percent to keep up with demand. Most of this increase—90 percent—is expected to come through higher yields and increased cropping intensity, according to the United Nations Food and Agricultural Organization. This is where investment and innovation in irrigated agriculture will contribute to food security. There have been tremendous water efficiency gains in irrigated agriculture over the past decade, Noel Gollehon reported. More efficient management and technology have reduced irrigation water use nationally from 25 inches per acre to 19 inches per acre between 1969 and 2012, an efficiency gain of 24 percent. Ron Rayner, farmer and Partner at A-Tumbling-T Ranches, highlighted a two-fold increase in production while using less water, and credits innovations in management and technology with the improvement. Paul Brown, Associate Director of Arizona Cooperative Extension, summarized Arizona agriculture’s gains in water efficiency for the conference. While irrigation in Arizona is still dominated by gravity systems, it has become more efficient through several techniques like shortening irrigation runs and changing the flow rate down the furrow. Water use in Yuma is down about 18 percent in the last 40 years. There is a move toward sprinklers, especially “solid set” sprinkler systems for plant establishment, where 50 to 75 percent reductions in water use are possible. Away from Yuma, agriculture has seen increases in laser leveling and large increases in center pivot sprinklers, especially in southeast Arizona. Area farmers also have rapidly increased their use of drip irrigation where tree nuts are grown. Additional water savings are possible through irrigation timing based on crop evapotranspiration, and this technology is growing slowly. An example of farming innovation and efficiency was offered by Arnott Duncan of Duncan Family Farms, which specializes in all organic greens and herbs. His focus is producing a quality of product and the farms use techniques designed to grow more and better product with high efficiency. These include portable drip irrigation systems set up for specific crops, as well as soil lubrication for dead-level harvesting, and use of organic matter to enhance light soils for crops with shallow roots. He is investigating high-tech automated microwave and cellular systems and sanitation systems at the farm level for use of recycled water. However, as Gollehon observed, efficiency does not always mean conservation. Efficient production may simply use the same amount of water to produce more. If conservation is the goal, other measures should be used. Fallowing is one agricultural water conservation measure that has received a lot of attention. In a panel on the subject, David Bradshaw, Assistant Water Manager with Imperial Irrigation District, Meghan Scott, attorney for BARD Water District, and Jack Seiler, farmer and Trustee for Palo Verde Irrigation District, described fallowing arrangements, how they work and how well. Components of fallowing programs include voluntary enrollment and limits on the amount of land that can be fallowed in a district. In the project described by Scott, it was explicitly stated that participation in no way affects water rights. In addition, the programs should contain mitigation actions to buffer communities dependent on the farm economy from losses. In general, farmers seem to like to see the secure income fallowing provides in hard times and banks understand the value of these arrangements. Bradshaw cautioned, however, that implementing fallowing for water conservation is complicated, and Scott added that measuring success in water savings is a problem. Despite these largely positive examples, Dan Keppen, Executive Director of the Family Farm Alliance, indicated that the immediate reaction of farmers to the idea of fallowing for water conservation is usually negative, although some folks are forced into it by economics. The idea has to be approached sensitively to acknowledge the value of farming. “Agriculture will not be the reservoir to meet water demands,” said Keppen. In Central Arizona, agricultural entities are facing the potential for major cut backs in their supplies of Central Arizona Project (CAP) water and are planning for meeting this challenge. With shortages on the horizon, water users are looking for ways to collaborate on problem-solving without sacrificing their fundamental interests. Central Arizona irrigators are at the table for negotiations regarding the Colorado River Basin Drought Contingency Plan and will continue to participate in efforts to keep water in Lake Mead to forestall a shortage declaration. However, many, like Dan Thelander, Partner of Tempe Farming Company, and Brian Betcher, General Manager of Maricopa-Stanfield Irrigation and Drainage District, are wary of the provision that CAP water for Central Arizona agriculture would drop to zero if Lake Mead falls to 1,075 feet above sea level. Betcher’s voice was one that questioned the fairness of the situation that Central Arizona agriculture should absorb system losses. Betcher described Central Arizona’s irrigated agriculture as scientific and integrated — “These guys know what they’re doing,” he said. Betcher noted that irrigators use highly efficient low head systems, have changed their crops, and have begun fallowing marginal lands. Ultimately, though, a cut in CAP water means a return to groundwater use to meet the needs of the district’s members. He highlighted the question of how much groundwater can and should they pump, which the district is facing in its planning for the future. Dan Thelander noted that the choices for agriculture in a water shortage are problematic. Farmers can install expensive irrigation systems, experiment with low water use crops, and switch to high-value crops. Though all of these choices have their drawbacks, Thelander sees some promising options including use of high organic material on soils to reduce water use while providing other benefits to the plants. In addition, growing guayule, a source for rubber, would respond to existing demand for this low-water use crop. Jason Hauter, attorney and Gila River Indian Community (GRIC) member, spoke from a different perspective about the potential role of GRIC in assisting with the Drought Contingency Plan and other needs related to shortages on the Colorado River. They pledged 450,000 acre-feet over 2-year period for Lake Mead. The GRIC has the largest single contract for CAP water (311,800 acre-feet per year) as part of its quantified right to 653,500 acre-feet of water. Community goals for the use of their water require flexibility, so they are not interested in 100-year leases. Instead, they will be focusing on short-term arrangements. According to Hauter, the GRIC don’t have a water supply issue; they have a water cost issue related to the cost of CAP delivery. Beyond Central Arizona there are other issues arising around maintaining groundwater supplies. Central Arizona has both CAP access and groundwater management restrictions for the protection of groundwater supplies, which other areas of the state lack. Clint Chandler, Assistant Director, Water Planning and Permitting Division of the Arizona Department of Water Resources (ADWR), described Governor Ducey’s Water Initiative, a planning process searching for stakeholder-driven solutions, which has prioritized attention to three “planning areas”, the West Basin, Northwest Basin, and Cochise planning districts. In these areas, as Chandler noted, “existing management tools may not be appropriate.” Active Management Areas and Irrigation Non-Expansion Areas are the two current possible tools, and they both prohibit irrigation of new lands. These would squash the budding wine industry, which shows so much promise for economic development in rural areas. Hart and Searle tried to come up with a third way by getting people together to work out their differences. What they came up with would allow water to move around within the basin, but put a cap on how much could be pumped. It did not reduce water use, but no new uses would be allowed unless moved from another part of the basin. There was an exemption for small domestic wells. The group made progress as long as there was a threat of an AMA being formed, but agreement dissipated after that ended. When they brought their “Groundwater Conservation Area” proposal to the Legislature, they were told that they didn’t have enough support. Things are not quite as volatile in Mohave County as described by Mark Clark, Manager of Mohave Valley Irrigation District and Bullhead City Councilman, but Mohave County has worries in some areas about the future. The Hualapai Basin could double its water use in the next 10 years. None of the available tools are proactive: petitioners were turned down for an AMA or an INA because they couldn’t demonstrate current drawdown. However, residents are still hopeful that something can be worked out. There is less optimism in the Cochise area. Hart offered the opinion that without a crisis change is unlikely. Searle suggested that the state lacks the will to solve the problem for such a small population. “If nothing is done, economics may drive the decisions,” added Searle. Doug Dunham, ADWR legislative liaison, said the department is trying to help rural Arizona find tools for coping with groundwater issues. He asked that the parties give the state a chance. Time is needed to get the right answer. Improvements in the regional discussions give hope. Past successes in solving water management challenges at the state level also give hope. The prime example is the story of the state’s 1980 Groundwater Management Act. The film, Groundwater: To Enact a Law for the Common Good, produced by Kathleen Ferris and Michael Schiffer, went behind the scenes on how the law came to be through conflict, threat, leadership, and compromise. Difficult negotiations resulted in a bill that spread the pain of losses for the sake of responsible groundwater management. In the end, farmers, along with everyone else in the most populous and water stressed parts of the state, had to accept limits on their water use but, as Rayner stated, at the same time their right to water was recognized. John Sullivan, retired Deputy General Manager of the Salt River Project, spoke about GMA’s impact in the Phoenix AMA, where it encouraged lining ditches, laser leveling, best management practices that encourage efficiency, use of reclaimed water, and water banking through Groundwater Savings Facilities. For the future, there is a need for continued collaboration because some things remain to be done. Partnerships are seen as key instigators for creating solutions. 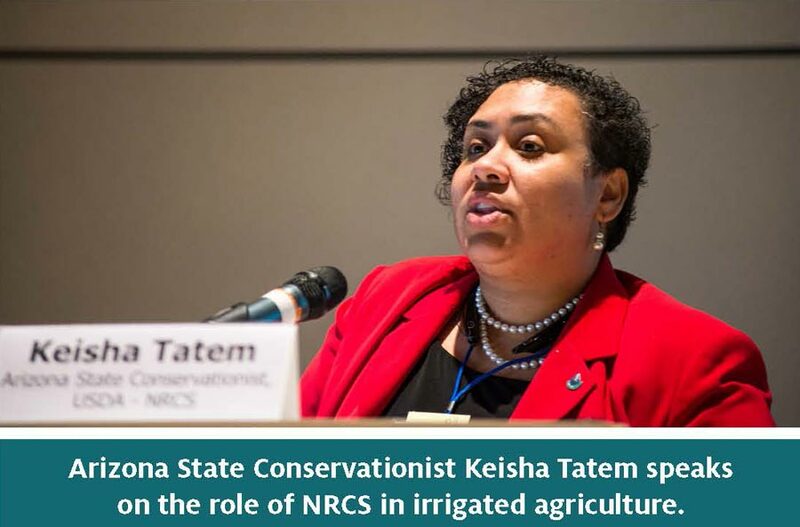 Keisha Tatem, the USDA-NRCS State Conservationist, emphasized their desire to leverage local partners for accomplishing common goals. 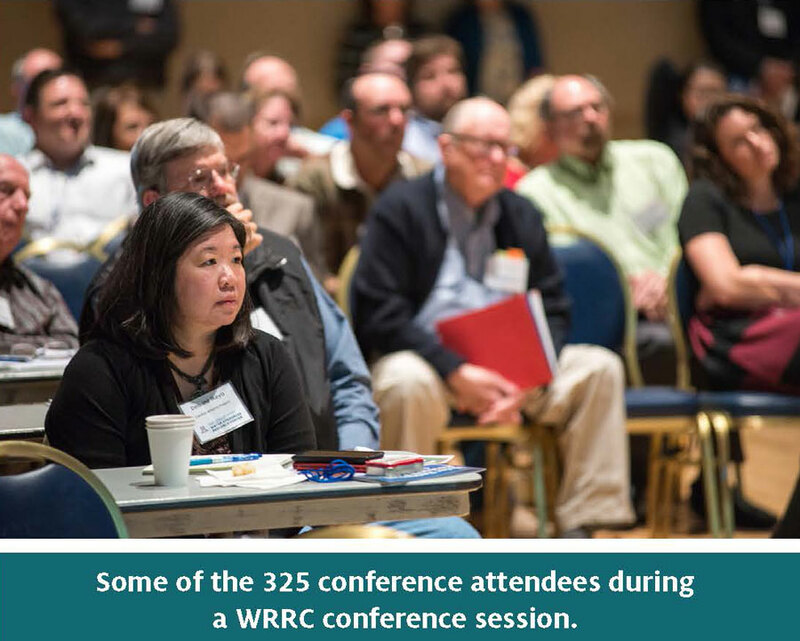 Betcher noted that the irrigation district is partnering with the Environmental Defense Fund on a study of options for sustainable groundwater use, and Hauter ended his talk on GRIC’s water use by reminding the audience that they are looking for partnership opportunities. Davis referred to the “Groundwater” film for his conference take-away message: “Sometimes unsolvable things can be solved by reasonable minds if they have no other choice.” For her summary of the day’s lessons, Sharon Megdal referred to earlier comments made by Sullivan calling for attention, perseverance, effort, and time for achieving solutions. She added “tension”—not crisis—but enough tension to create conditions for collaborative problem-solving.